Welcome to my adventures in knitting, sewing, baking, and life. ← we have a winner! 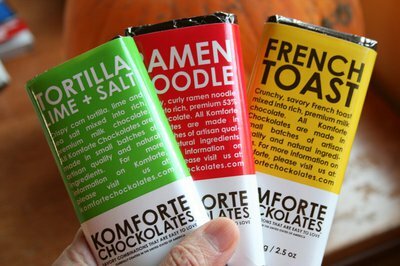 If you’re in search of stocking stuffers or just a little treat for yourself, please check out Komforte Chocolates, brought to you by our blog buddy Blair of Wise Craft. You can read all about the history of these chocolates as well as how to order them here. As you can see, they are offered in some very interesting flavor combos, currently Tortilla Lime + Salt, French Toast, and Ramen Noodle, which has little bits of ramen noodles in it! These do not taste as oddly as you might imagine. The flavor combinations are balanced and highly edible. They are practically like meal replacement bars, though your mothers would probably not approve. But I mean, come on, French Toast bar for breakfast, Ramen Noodle for lunch, Tortilla for dinner, and you’re set! Thanks to Blair for sending me some samples! I always get excited when people make their dreams a reality. I don’t know if Blair and Peter have always dreamed of starting a chocolate company, but dang, it’s definitely one of my dreams, so cheers for them! This entry was posted in candy/chocolate. Bookmark the permalink. French toast chocolate bars? I think I may be able to die happy knowing these exist! Those sound like a super load of fun. Hopefully they will do well and they will make their way across the United States. I will have to talk to Ed, who runs the chocolate store I go to most frequently, and ask him if he could ask about wholesale orders. I have some of the Ramen chocolates in my purse as holiday gifts. Split an amazon order with a friend who was hoping for some ramen seasoning in it as well… Alas. None. Lydia on Sorry for the interruption. Jill on Sorry for the interruption. Malia on Sorry for the interruption.